Thank you for enquiring about our villa. We think it is a very special place, however don't just take our word for it, please read all the reviews. THESE ARE THE ONLY WEEKS LEFT AVAILABLE. Also the above rates are only for direct bookings. You can find our contact email in the name. You can also book through HomeAway but you will pay considerably more than the above rates. Do let us know if you have any questions or would like to book. Situated on its own private headland Ionian Dream Villa has drop dead gorgeous views all the way around, overlooking the sea with Zante in the distance and the beach directly below, behind is Mount Aenos. The beach itself is a beautiful, sandy, almost private beach (never gets crowded) set between cliffs. The villa has been built with a natural stone frontage to blend in with the landscape, and offers 3 bedrooms and 2 bathrooms – and 2 infinity pools : a main swimming pool, and a smaller Jacuzzi pool to just relax in and enjoy the views. Fully air conditioned the villa is luxuriously appointed with Miele fittings in the kitchen. While the lounge has a LCD TV, DVD, Playstation, Wii and FREE Wifi. The villa benefits from a large balcony and patio with built in BBQ. At the end of the day..... please read the reviews. It sums up the villa far better than anything we can say !! Wifi is installed and is free for our guests. We have always resisted as a family as the villa is the perfect place to relax and unwind. Yet it seems that progress can't be stopped ! Our children are now demanding wifi - so we have given in. New for this year is a lovely set of outdoor furniture and also a astronomical scope - everyone talks about the amazing night skies (no light pollution) so we have a scope to enable you to spot the milky way even better. Kefalonia is a large, unspoilt Greek island. Very pretty with lots of Greek charm and not at all crowded (even in peak season) it is a perfect place to relax in the sun. The beach is directly below the villa. We think it is very beautiful and perfect. It never gets crowded. To get there turn left from the villa and follow the road to the beach. Just because of the direction the beach faces the evening light is amazing – so perhaps go down one evening as well as during the day. Please look after the beach and don’t litter. They try to keep it low key but turtles do nest on the beach in the summer. Last year there were 2 successful nests on the beach ! They tend to hatch in September so look out for those if you are at the villa during this month ! This is where you will probably eat out most. Just head back to the main road and turn right. You will reach Kateleios after 5 minutes. Drive down to the sea front and stroll along the beach front tavernas. Choosing which one takes your fancy for an evening meal is a very pleasant occupation. Many of the tavernas also offer reasonable breakfasts and lunches. This is a very long strip of sand (about 4 miles long). It shelves very gently and is perfect for little tots. There is a small taverna on the beach. It is between Katelious and Skala. Again just follow the sign off the main road. Kaminia is the first stretch you reach, Mounda a little further on. Beyond Kateleios, Skala is more of a resort – but still very nice too. The beaches here are good, and there are also some very nice restaurants, some perfect for that special occasion – or if you just want to indulge. If you are staying a week you might not manage any more than the above, but there is still plenty more to see. Take the coast road beyond Skala, it is very scenic and there are lots of beaches you can stop by. Poros itself is more of a real town rather than a resort, but still has character. As the sun starts to drop we would recommend the restaurant on the headland overlooking the beach. With so many beaches to explore you often forget about the rest of the island. A very nice scenic drive is the trip to the port of Sami. From the villa turn left, but instead of driving straight on to Argostoli at the next fork turn right for Sami. You soon start climbing and the views are fantastic. Sami is famous for the filming of Captain Corelli’s Mandolin and has a number of pleasant tavernas on the waterfront. At some stage you might feel the urge for a shopping expedition – in which case Argostoli is the place to go. Much more cosmopolitan than the rest of the island, it has not only large supermarkets but plenty of designer shops as well. It is worth getting your bearings. As you drive into Argostoli try and keep to the waterfront, keep going until you can find a parking spot on the right hand side. You can always get parking at the ferry terminal if you haven’t found parking by then. The main shopping street runs parallel to the waterfront - just a couple of streets behind the seafront. It is pedestrianised and unlike the rest of the streets it is paved in marble ! Everyone who is anyone promenades up and down or just hangs out in the numerous coffee shops. Walk right along this street, pass the town hall and you will eventually come to a square – there is a whole host of restaurants here – just take your pick. Well worth a visit. This little harbour is in an incredibly beautiful setting. The most photographed beach on the island – although pebbly rather than sandy. At the far north of the island and a favourite with the sailing set. Directly behind the villa is Mount Aenos. It is a very dramatic mountain and dominates the area. There is a road that almost goes to the top and the views are just amazing. If any one gets to the top let us know. We have never made it ourselves – the draw of the beach and the pool is just too much ! Worth an afternoon’s exploration. This old Venetian castle, although now ruined is worth a visit (there are also some nice cafes’ on the way up). There are 2 sets of caves near Sami, open for tourists. One you walk down, the other you go in a boat into an underground/sunken lake. They are both different and we couldn’t recommend one over the other. If you are exploring and are visiting Sami it is a nice thing to do. Have you read the book – The Beach. It’s original premise is that a group of people have heard about the most beautiful beach imagineable, but it’s location is very much a secret, and it is difficult to get to. The group then have adventures trying to find the beach. Well on our family holiday this year we discovered such a beach in Kefalonia – it is truly very beautiful. Very few people know of it – and yes it is difficult to get to. Flights - Direct flights are available from the UK all year via Athens on Olympic Airways and Easy Jet. Easy Jet, Ryan Air, Thomson Fly, Thomas Cook, and other charter flights all offer direct flights within season. Hi We are just a normal family with 3 young children. We go to the villa once or twice a year to recharge the batteries, relax and get away from it all. The villa is very private so it is either incredibly peaceful - or (in our case) the kids can make as much noise as they want and you won't annoy anyone else. We offer the villa for rental as it obviously helps the villa pay its way. As you will read from the reviews we have tried to give you something special. After visiting so many villas ourselves we think we understand what it takes to offer a great villa holiday - and we do our utmost to provide it, recognising that it is obviously a highlight of your year. As a couple we had been on villa holidays for many years as independent travellers. Over the years we got to experience what worked and what didn't in a villa. We eventually decided to take the plunge and look at buying our own - somewhere for a family to enjoy year after year. After trying many different destinations (Spain, Turkey and France) we settled on Kefalonia - it is very much unspoilt, yet offers everything you need for a lovely holiday. We just had to find the right spot. After a year of searching we did indeed come across the right spot. Stunning views in an unspoilt location. The only draw back was that we would have to buy the land then build the villa ! Eighteen months latter and after a few tribulations the villa was finished. We have tried really hard to add in all those touches that we thought were great when we were sampling other villas. Now, with 3 children it is home from home (all 3 have learnt to swim in the pools, and now swim like fish). In all our travels the one thing that stood out was location - a really beautiful location overlooking the sea was impossible to beat - and somehow we had found it. To top it all the location just happens to overlook probably one of the best beaches on the island. We then just had to build the villa to match the beauty of the location. On the design we tried to build it to take advantage of the surroundings. For instance we liked the idea of getting out of bed, taking a few steps and diving straight into the pool. We also made the patio extra large so there was plenty of space for alfesco dining and just taking in the view. The villa is also South facing - so we have added in a few verandas - just to give spots of shade. As a young family we also knew of the benefits of a slightly shallower pool - so we have opted for two, a deep one for adults, and a shallow one (with jacuzzi and waterfall) for kids, or adults that just want to relax. After a few seasons we have been thrilled with the feedback from our guests....and we want to continue to get it right in the future. There are 2 bathrooms, one for the master bedroom containing a step in double shower. The other has a bath, shower and twin sinks. The view from this villa is stunning, including during the thunderstorms on our arrival which were spectacular. The villa has everything you need including George who brings you local produce during the week and maintains the fantastic pool. His overwhelming kindness and generosity was so typical of the Kephalonian people who we met. Early morning walks down to the beautiful Koroni beach were something special and for those who like a long walk Mount Aenos is close at hand. 30mins from the airport, turning off the main road, the approach to this villa had us a little worried - a very bumpy gravel track made worse by some severe storms we had managed to avoid the previous week had us all looking at each other a little nervous. We needed have worried. As soon as we saw the villa we knew it was going to be awesome and we were not disappointed. Standing proudly on the edge of a ravine, as soon as you walked into the pool area you felt like you were a millionaire. Amazing views of the mountains to the back and the sea to the front without a single villa in sight, you really did feel like you had ultimate privacy. Ian's instructions via email regarding driving to the villa are far better than any satnav, and all the tips provided about things to do and places to shop were invaluable. Try and arrive during daylight hours otherwise I would imagine the road the first time in the dark would be a little disconcerting! The villa itself it nicely furnished and the kitchen is equipped with everything you could need and more. We were greeted by a lovely hamper with everything we needed for a cup of tea and some toast/cereal. From the balcony you can watch the sun rise over the mountains but the sunsets viewed from the pool in the evening are spectacular - how many places can you do that in? We had a hire car and drove around a lot of the island, going to many beaches and the four of us all agreed that Koroni beach was the best overall in terms of clear water, sand and not too many pebbles. Sesto bar just down the road is great. If you are looking to feel like a millionaire, escape reality for a bit, and have a luxury base to explore the island then I would heartily recommend this villa. Ian's communication was superb before, during and after, a genuinely nice couple who want you to have a lovely holiday and do a lot to help (aided of course by George, a Kefalonian Character for sure!). Delightful property in a perfect location! Lovely Villa with spectacular vista across to Zante. this is a place to stay when you really want to get away from it all- it is supremely well equipped to cater for those who just want to relax. Apart from a visit to the supermarket and beach- or a meal out (Great fish restaurants in Skala), I'm almost embarrassed to say there is actually very little need to move beyond the property! We really enjoyed the little areas which let each of us do our own thing- sink into a hammock, lounge on the verandah sofa or the giant outside 'round sofa' directly below, laze on the sunbeds by the pool, play table tennis, or just have a coffee at one of the 3 table areas outside. I actually spent 3 nights sleeping on the verandah- just taking in the Stars, Planets and the gasses of the Milky Way- beautiful and humbling night skies- and I strongly recommend using the telescope! George is a veritable institution- checking we were OK throughout our stay, bringing Honey, Melons, Wine, Beef Tomatoes & Olives to us during the course of our all too brief stay- and he is quite a 'classicist' too- a great ambassador for the Island. I have no hesitation in recommending this as a delightful place to stay. We've done something we've never, ever done before- we've already booked for next year! We had an amazing week at the Ionian Dream Villa. It lived up to all our expectations, as the villa has a perfect location. George (caretaker) couldn't do enough to help, also supplied us with honey, fruit and other gifts. It has been the best villa we have ever stayed in, Ian and Nicola own a 'little gem'. The only negative, a week wasn't long enough!! Dave, Kathy, Sam and Rebecca Bromell. Ionian Dream Villa is directly above a sandy beach and just a 5 minute drive from the picturesque fishing village of Katelios with its string of pretty tavernas and restaurants on the sea front selling local produce and sea food - a perfect way to spend an evening watching the sun go down. A little further on is the resort of Skala, always popular with people that return time after time to enjoy its long sandy beaches and relaxed atmosphere. The villa is directly in front of Mount Enos, declared a national park, with stunning views from the summit. Other attractions on the island include the port of Sami, from Captain Correlli's Mandolin fame, the dramatic Myrtos beach, the famous Dhrogarti Caves, and the pretty villages of Assos and Fiskardo. Argostoli, the capital is full of locals promenading on a summers evening down the main street, enjoying a coffee or dining in the good selection of restaurants. The rental rate includes maid cleaning once a week, all electricity and water. A security deposit of 300 Euro is required to be paid on booking. Winter rental available on request. 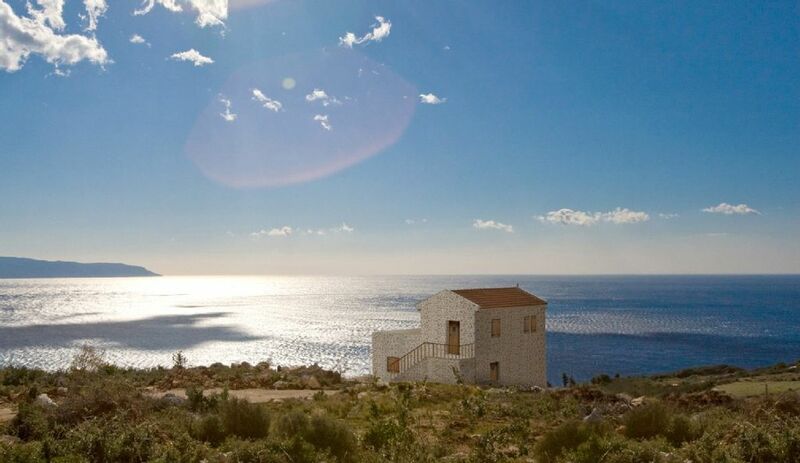 Ionian Dream Villa is perfect to get away from it all on a Winter's break. The climate is mild and sunny well into December.